[German]Does system restore refuses to work in Windows 10 (or other Windows versions) and stalls with error code 0x81000203? Here a few hints, what’s the reason. Recently I stumbled upon a post in German Microsoft Answers Forum, where a user was facing serious trouble using system restore. Trying to do a system restore ends with error code 0x81000203. Searching the Windows error data base ends with an unknown error for code 0x81000203. So I searched the web and identified two root causes for this error. In most cases, AVGs TuneUp Utilities 2009 / 2010 / 2011 is causing this issue. 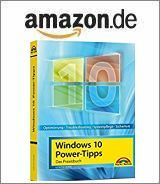 I mentioned it in my old German blog post from 2011: TuneUp Turbo mode disables something (I guess the VSS provider), so system restore can’t be uses anymore. So turn off Turbo mode in TuneUp Utilities and your system restore error should be vanishing. And if that’s the case, start thinking to kick TuneUp Utilities from your system (I have seen TuneUp as a ‘major problem bear’ for many Windows issues). If TuneUp (nor other tuning tools) never has been installed/used on your system, maybe Microsoft Software Shadow Copy Provider service isn’t running. 1. Open Task Manager und go to Services tab – then check, if the service VSS is executable. 2. Press the Services button in the lower right corner of the Task Manager’s Services tab. 3. Search for the entry “Microsoft Software Shadow Copy Provider” and double click it. Then check, it this service can be launched. Note also the answer of phantasma here about the settings for services. If the service can’t be launched, check whether a system policy prevents this launch (see also). The steps below are only for Windows Pro/Enterprise systems, because Windows Home doesn’t have gpedit.msc. 1. Open gpedit.msc from Start/Taskbar’s search box. 2. Navigate to Computer Configuration\Administrative Template\System\System Restore. 3. In the right pane, set the “Turn off system restore” policy to “Not configured”. After a restart the service shall be executable and the system restore should work. Because Windows Home doesn’t have gpedit.msc, I guess, the policy has been set by TuneUp and similar tools. So try the following steps. 1. Fire up registry editor regedit.exe using Run as administrator to execute it with administrator rights. 2. Navigate to the following key and check for the value mentioned below. If there is a subkey SystemRestore, check, whether the subkey contains the DWORD value DisableConfig. If that value is present and set to 1, system restore is blocked (see also KB283073 (and this MS answers forum thread). Either delete DisableConfig or set it to 0 and reboot your machine. Then system restore error 0x81000203 should be gone. This entry was posted in issue, Windows and tagged error 0x81000203, system restore, Windows, Windows 10. Bookmark the permalink. Hallelujah, thanks so much, that worked for me! I had indeed recently used Kaspersky Removal Tool.